Thousands of people protested in Morocco on Sunday over constitutional reforms they said did not go far enough, but an official said they were out-numbered by people demonstrating in support of the changes. Morocco’s King Mohammed handed over some of his powers to elected officials in a referendum viewed in other Arab monarchies as a test case for whether reform can hold back the wave of “Arab Spring” uprisings sweeping the region. The king’s reforms were endorsed by 98.5 percent of people who voted in the referendum on Friday, according to the interior ministry, but opponents say the figures were inflated. A Reuters reporter estimated the protesters, in the Beni Mekada suburb of Tangier, numbered about 10,000. But an interior ministry official said there were only 1,000 opposition demonstrators in the city while 3,000 protested in favour of the reform. “We wanted to send a message that even after the fraudulent referendum, we are still here,” said Khalid Laasri, who was taking part in the opposition march. There was no sign of uniformed police officers around the march. The February 20 opposition movement — inspired by uprisings which ousted leaders in Tunisia and Egypt — has been holding regular protests for months, but Sunday’s demonstrations were the first since the referendum. Opponents said the changes did not go far enough because they left the palace in control of security, defence and religious issues and did not tackle graft in the government. “A farmer needs to clear stones and weeds before he ploughs the land. With this reform, we plough without ridding the country of corrupt people,” said Abdelali, a 42-year-old real estate entrepreneur in Tangier. 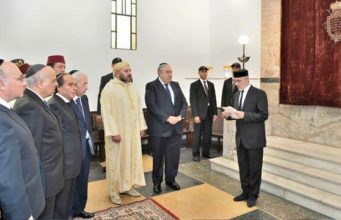 The majority of Moroccans revere the king and the protest movement has failed to gather the momentum or widespread support that toppled leaders in Egypt and Tunisia. The February 20 movement also organised demonstrations on Sunday in the capital, Rabat, and in Casablanca, Morocco’s biggest city. There were contradictory accounts of the numbers involved. A Reuters reporter in Rabat said he saw about 4,000 protesters, with police keeping them apart from several hundred government supporters. The interior ministry official said the protesters numbered 1,500. In Casablanca, February 20 activists said 20,000 people turned out to protest the referendum. A local council member said there were 8,000 demonstrators with a few hundred counter-protesters. 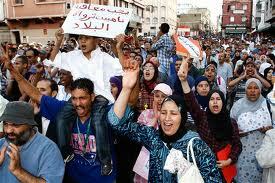 The interior ministry official said 20,000 people demonstrated in Casablanca in favour of the reform.